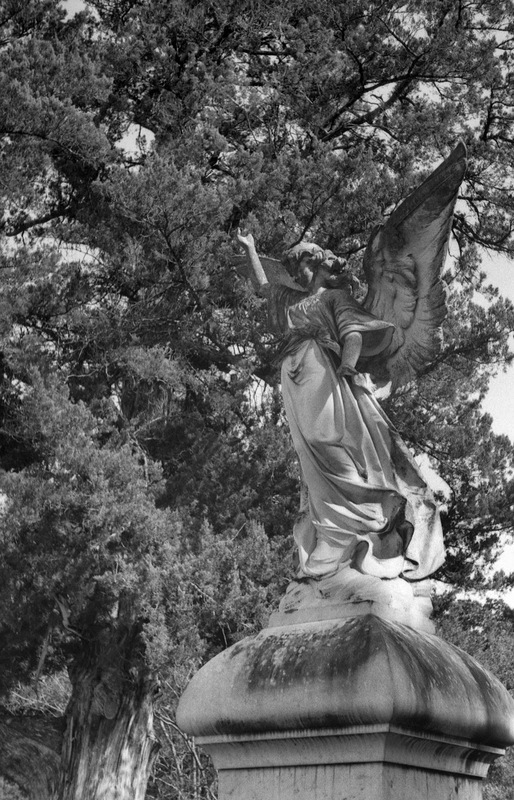 The Clark angel marker at historic Oak Grove Cemetery in Nacogdoches, Texas, photographed Sat., Jan. 31, 2015, with Mir rangefinder camera c. 1960 from Former Soviet Union and Industar 50, 50mm f3.5 lens on Ilford FP4 Black and White Film. This week, I'll be talking a bit about my newest camera from the Former Soviet Union. I know, last time I wrote about what was supposed to be the final installment of the Analog East Texas Project, the ongoing project I worked on during 2014, using vintage film cameras from my collection. Well, you didn't really think I was going to quit shooting, just because I wrapped up the project as far as the newspaper is concerned. In fact, I'm very happily continuing to shoot with the film cameras, just going in a new(ish) direction. And, as the party continues, I've picked up a couple of new pieces of equipment to supplement my growing collection. The first (I'll talk about them in the order they arrived from the Former Soviet Union) was a M39-mount Jupiter 12 lens, the Soviet version of the Zeiss Biogon 3.5cm f2.8 lens designed for Contax cameras. This is actually my second Jupiter 12 lens. The first I received as part of a kit with the Kiev IV camera I purchased last year, which is the FSU version of the Contax rangefinder. already have, as well as the new camera I'll talk about in a moment. 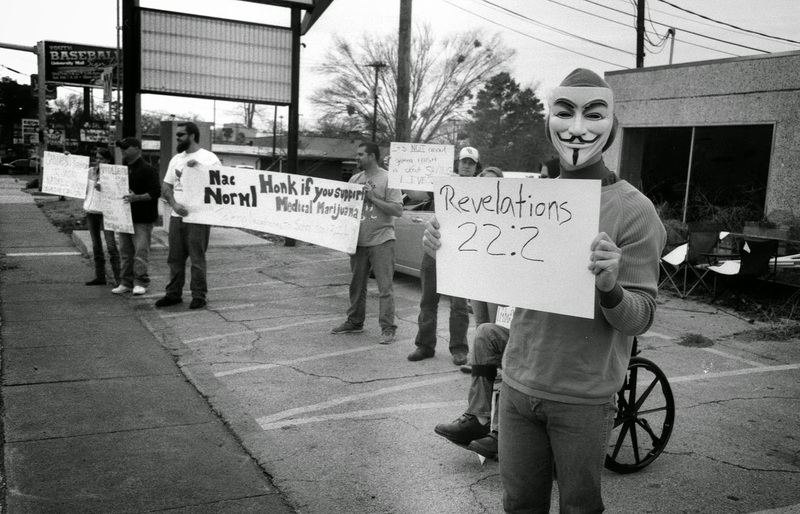 Members of the Nacogdoches chapter of the National Organization for the Reform of Marijuana Laws (NORML) stage a peaceful protest Saturday, Jan. 31, 2015, in support of Texas House Bill 507, calling for the decriminalization of possession of one ounce or less of marijuana, as well as legalizing whole plant medical marijuana in the state. Image made with Mir camera and Jupiter 12 lens on Ilford FP4 black and white film. I think the 35mm focal length is probably one of the most versatile formats. It's great for landscapes and for street photography. It's not so wide that it distorts straight lines, yet is wide enough to show a broad vista. My second new toy is a Mir, a 35mm rangefinder camera manufactured in Moscow from 1959-1961. The Mir is a simplified version of the Zorki 4, yet another in the long line of clones of the venerable Leica cameras from Germany. The difference is the Zorki was produced for export while the Mir was manufactured for sale only within the former Soviet Union. Also, the Mir was designed without the separate timing device allowing shutter speeds slower than 1/30th second, which is probably a good thing, because I've learned the timing device is very delicate and easily malfunctions. Based on the design and serial number, my Mir is a version 3 built in 1960, so it's as old as I am. (It's body number 942, so it actually may be a few months older than me.) But, according to the seller, it was factory refurbished before I bought it, so is as good as or better than new. It came with a refurbished Industar 50, a 50mm f3.5 lens, which also was reworked before sale. 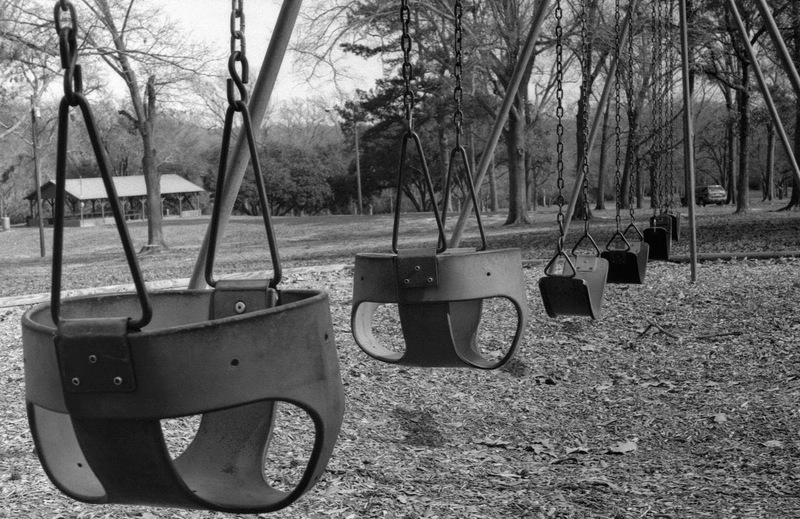 Swing set at Pioneer Park, Sat., Jan. 31, 2015, in Nacogdoches. Texas. Image made with Former Soviet Union Mir camera with Industar 50, 50mm f3.5 lens on Ilford FP4 Black and White Film. I've put a grand total of one roll of film through the camera with both lenses, so my experience with the camera is quite limited. But, so far, I love it! It feels very nice in my hand, the viewfinder is huge and bright with a 1:1 magnification factor, so it's easy to focus and, from the results, it's dead on as far as the shutter speeds go. People have asked me why I seem to be falling in love with the FSU cameras. I have four now, including a second, not-working Mir body I got as part of a member trade through the Rangefinder Forum website at Christmas. To be honest, I'm not 100 percent sure what it is about the FSU cameras which attracts me. I mean, they're rangefinders, which are notoriously difficult to shoot with. They were manufactured usually under less-than-ideal working conditions with sometimes less-than-ideal quality control. It's no secret, really, the FSU cameras can be kind of a crap-shoot. I happen to have been fortunate with my purchases, despite minor problems with the lens which came with my FED-3, problems which could be addressed once I get up the nerve figure out how to clean and lube the thing. Generally all my FSU cameras are good shooters. 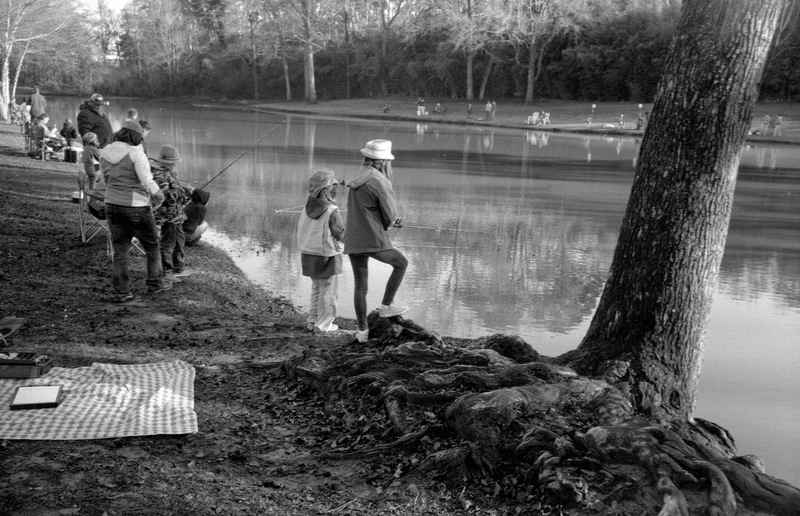 Family fishing during Nacogdoches Kid Fish event Saturday, Jan. 24, 2015, at Lakeside Park in Nacogdoches, Texas. Image made with Former Soviet Union FED-3 rangefinder camera with Jupiter 12, 35mm f2.8 lens on Ilford FP 4 film. And I have to admit there's a novelty factor to the things. I was shooting the annual Nacogdoches Kid Fish event, where the city stocks a local lake with trout and invites families to fish for free, on January 24 and I brought out the FED with the Jupiter 12 to give it a good workout and test the lens. As I was walking around, one of the exhibitors from the Texas Parks and Wildlife Department saw the FED from 20 feet or so away and we ended up talking about the FSU cameras, rangefinders and film photography in general. But that's something I noticed throughout the Analog East Texas Project. People would see the vintage cameras — particularly when I was shooting with the REALLY old cameras like the Brownie Hawkeye, Tourist II folding camera or any of the Duaflex models — and it was almost like a ticket into making their photos. My subjects would seem less intimidated by the old, analog cameras than they were, say, by the big, modern digital cameras I use for work. It also led to some very interesting conversations with people recalling their families using similar cameras when they were growing up. I'm really not sure where I'm going with the FSU cameras. There are so many models, most with several variations, there's realistically no way I could assemble a complete collection. Economically, if for no other reason, it's just not feasible. I do know it's fun taking these cameras which could have been languishing in closets or gathering dust on shelves and putting them back into the service for which they were designed — making photographs. It's definitely something I plan to continue. If you want to see more, you can check out some of my work on Flickr.